You are going to Watch Naruto Shippuden Episode 262 English subbed online free episodes with HQ / high quality. Stream Anime Naruto Shippuden Episode 262 Online English sub War Begins. The Allied Shinobi Forces’ Commando Unit, led by Kankuro, enters the enemy territory. The Undead Commando Unit captures Tokuma, Ranka and Muta. Kankuro and his men deploy a small trenched outpost to survey the environment until Muta appears in front of them, who happens to be attached to Sasori’s chakra strings and planted with Deidara’s bomb. Taji attempts to save Muta but Deidara detonates Muta and in a split second Ittan sinks their outpost with his Earth style jutsu to avoid the explosion. Tokuma and Ranka descend to attack Kankuro’s unit but Omoi manages to cut Sasori’s chakra strings, saving Tokuma and Ranka. Kankuro tugs Sasori down and Ittan raises their outpost. 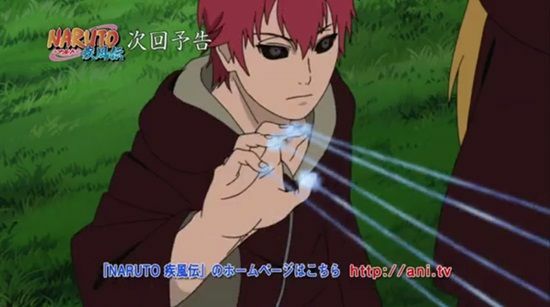 Kankuro tells Sasori that it is the first time he sees Sasori’s real form, recalling their previous clash before summoning Sasori’s puppet body to settle things.